Niegel is a theater director and performance artist who sculpts social spaces into unique communal environments where we make new rituals, excavate our pasts and imagine future narratives. His theater work has been produced by Classical Theatre of Harlem, HERE Arts Center, Hip Hop Theatre Festival, Magic Theatre, New York Fringe Festival, Phoenix Theatre Ensemble, The Public Theater, Summer Play Festival and Todd Theatre, and his walks have been produced by Abrons Arts Center, American Realness, Dartmouth College, Elastic City, Jack, The New Museum, Prelude Festival, PS 122, the Van Alen Institute and Visual AIDS. He often collaborates with artist Todd Shalom. Together, they conceive and stage interactive performances in public and private environments. Smith was the associate director of the Tony Award winning musical FELA! – restaging that production in London, Lagos and its world tour, assistant directed the off-broadway production of The 25th Annual Putnam County Spelling Bee and both the broadway and off-broadway productions of Tony Kushner’s Caroline, or Change. 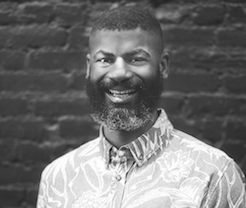 He has worked on the artistic staffs of The Public Theater, Trinity Repertory Company and Providence Black Rep. He is a 35th Anniversary Artist-in-Residence at Second Stage Theatre and the Associate Artistic Director of Elastic City. A graduate of Dartmouth College, Smith has received grants and fellowships from Theater Communications Group, Tucker Foundation, and Van Lier Fund. Before surviving high school in Detroit, he grew up in the North Carolina piedmont, fishing with his dad, shopping with his mom and inventing tall-tale fantasies with his two younger brothers.